SEO short of Search Engine Optimization has now become the buzz word in this web 2.0 world. With search engines like Google getting smarter, SEO campaigns should be left to the professional to reap maximum benefits. If you take my word, SEO campaigns are like any other marketing campaigns, in marketing campaigns you target your audience, then make adverts be it print, audio or audio visual and start your campaign. In SEO you choose your keywords, apply some SEO magic and see your conversion rate get better. But major difference is push and pull marketing, in SEO the potential client is searching for you so you have more chances of converting the potential client to a client. 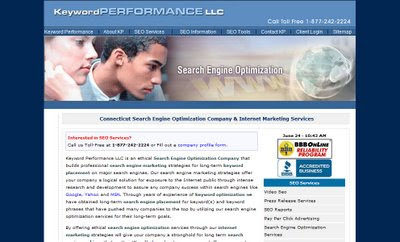 Searching for some SEO company I found KeywordPerformance.com a good one. They claim years of experience in search engine optimization and tell they have obtained long term search engine placement of keyword(s). They aim to provide ethical search engine optimization which will organically rank you higher in search engines leading to maximum conversion rates and finally to more profit for their client. The SEO tools on their website like link popularity checker, server header checker and SEO glossary are very useful if you want to check your website’s current SEO status. The tips and articles about SEO included in the site come handy if you want to dig deeper into SEO. The main menu laid vertically with sub links poping up is good but if they could make it on hover rather than click it would have been better. They even provide a client login which deals with billings, website statistics and other things. Keyword performance is an internet marketing firm which provides services like internet marketing, video SEO, search engine placement, search engine rankings etc. The sitemap page fully depicts the sections of the website and the pages in the website. A suggestion I would like to make is that if they had put some client testimonials it would have been better, as a visitor would know who has been their client and what the client’s response to the service provided was. They also have seo blog section, in this section they blog about SEO and related topics. I found the blogs in the SEO tools category interesting. The blog seem updated but I guees they can add more content to the blog section. In relation to the design of the website, it looks average but it can be made better with some Web 2.0 things. They can work on the user interface, color combination and typography to make the visitor feel better and also uplift their own SEO ranking. All in all, KeywordPerformace.com is a good website and I hope the company provides outstanding SEO services as it claims. The website can be made better. Hope you rank higher in all major search engines with good and ethical SEO practices.